General Information: These are easily recognized by the knob-like formation on the stem end. They have few, if any, seeds and are exceptionally sweet. Tangelos are deliberate or accidental hybrids of any mandarin orange and the grapefruit or pummelo. The first known crosses were made by Dr. Walter T. Swingle at Eustis, Florida, in 1897, and Dr. Herbert J. Webber at Riverside, California, in 1898. They are so unlike other citrus fruits that they have been set aside in a class by themselves. The Minneola tangelo (sometimes misspelled "Mineola") is a cross between a Duncan grapefruit and a Dancy tangerine, and was released in 1931 by the USDA Horticultural Research Station in Orlando. It is named after Minneola, Florida. 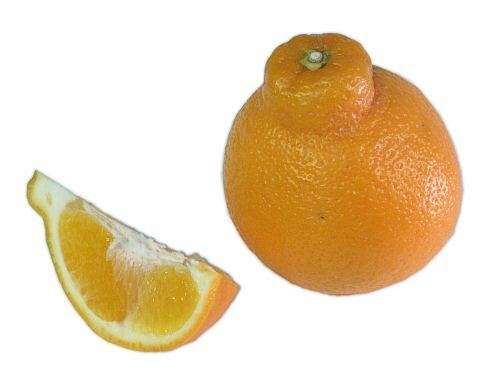 Most Minneola tangelos are characterized by a stem-end neck, which tends to make the fruit appear bell-shaped. Because of this, it is also called the Honeybell in the gift fruit trade, where it is one of the most popular varieties. The fruit is usually fairly large, typically 9 - 9½ inches in circumference. The peel color, when mature, is a bright-reddish-orange color. The rind is relatively thin, so the fruit peels easily. It is quite juicy.